Certainly by the fall of 1948 the winds of change in music, black popular music that is, were being felt by anyone who made their living on a bandstand. Urban electric blues were replacing acoustic country blues, bop was elbowing swing from the spotlight in jazz, while rock ‘n’ roll was racing ahead of them all for jukebox spins, pushing the more refined, tightly orchestrated bands and mellow crooners to the side. There’d still be room on the stage for all, old and new, blues and jazz as well as rock of course, but it wasn’t too hard to see what was at the forefront of things these days and the only question wasn’t whether the old guard would make a comeback and reclaim their positions at the head of the pack (they wouldn’t, they never do once the new comes along) but rather how long would this uprising last and would it fade before becoming entrenched as the dominant trend, allowing for something ELSE, something no one’s ever conceived of yet, to muscle in? But these questions, while apparent to us well over a half century later, likely weren’t asked or even contemplated by many at the time, at least not consciously. A working musician, even those who wrote their own material, had no time for such big picture views of the landscape, they simply had a job to do – play music and get paid and to keep doing it for as long as they were able. In 1948 that usually meant going on the road, in one club or another, anywhere from the big cities to the backwoods, and your ability to draw a crowd may certainly have been HELPED by a new hit record, but as long as you’d already had one at some point in the not so distant past you probably felt you could keep on playing without adding much to the résumé. Cecil Gant, as we’ve already discussed, HAD that one big hit in his past. That it was now three years earlier mattered not. The song – I Wonder – was SO big that he’d be able to make his living on it for years, provided that he still put on a reasonably good show otherwise. So in Gant we have a curious figure to study, someone whose popularity pre-dated rock music courtesy of a hit in a style that was far removed from rock’s most gaudy, wild antics, yet he was also perfectly capable of those wild antics rock was building its own legacy on already. As Gant had shown from the very start he could pound the piano with the best of them and had been doing so on record over countless B-sides for years. That’s what we have here only now it was this type of B-side that was going to keep him relevant going forward. Therefore it’s interesting to contemplate just what Gant might be thinking when he entered the studio back in his hometown of Nashville in another attempt to strike pay-dirt again and bolster his drawing power a bit more by churning out a hit in a newer, and now even hotter, style. By the looks of it Gant really didn’t give it much thought at all. His recorded output, as always, was scattershot in its approach, running the gamut from jazzy sides to bluesy shuffles, from ballads to rock barnstormers. He was, at heart, a nomadic musician, perhaps unsuited to the kind of sudden fame he found himself with back in 1945 when “I Wonder” briefly turned him into a household name. From that point forward his name was never spoken much of again in the present, yet was still familiar as a somewhat distant echo from the past. He was still in demand though, not just the live gigs in which he earned his living but as a recording artist by companies desperately hoping to catch lightning in a bottle with him a second time, or failing that, hoping that his still recognizable name might at least pull in a few more sales than a total unknown would. For a record company struggling to stay solvent, those “few more sales” he might bring in could mean the difference between breaking even or folding your tent and slipping out a side window as irate creditors broke down your front door. As a result Gant was never at a loss for recording sessions, yet for the most part he seemed at a loss in establishing a clear direction for furthering his career beyond what it already was. You want him to cut a few sides? Sure, he’d be glad to… cash up front if you don’t mind. You want him to try whatever brand of music seemed most promising at the time? No problem at all, versatility is Cecil Gant’s middle name. But do you want him to lead the way into the future, to take what’s already been established by this new breed of musician and harness it, steering it in a direction that can be expounded upon by other artists and exploited by other record companies? Sorry, you’ll have to look elsewhere for that. Cecil Gant just didn’t have that in him constitutionally. What we get instead is what the title of Cecil’s Jam Session not so cleverly promises – a jam session – which opens rather uniquely with a spoken word exchange between a forlorn Gant and an unnamed female acquaintance who spurs him into feeling better by repeating an adage that Cecil himself reputedly always told her. From there – a full thirty-eight seconds in – we storm headlong into a rip-roaring barrelhouse stomp on the ivories by a suddenly rejuvenated Gant. What there is to dissect in the record really happens in those first thirty-eight seconds, an eternity as far as spoken intros on instrumentals go (or instrumental intros to a vocal performance for that matter). It gives an otherwise aimless song a bit of a structure, unusual though it may be, and a calling card that makes it instantly identifiable after hearing it just once or twice, something a lot of instrumentals, even much better ones than this, can struggle with unless the main riff or hook is so memorable that it needs no other markers. In this case it DOES need that intro to make this stand out at all, for while Gant was always a fine boogie woogie soloist, possessing a rock solid left along with a nimble right hand, he was also a notorious improviser, someone who couldn’t play a song the same way twice. He was the kind of musician who seemed to care little of structure or song craft, and never was going to work anything out too far in advance and so you better hope to catch him at a moment where everything fell in place rather haphazardly or you might not get anything really useable at all. Not surprisingly this record, for all of its dexterity and drive, suffers from that tendency. It has no real hook, there’s no form or shape to build off of and embellish somehow, nothing familiar to return to once it gets going, and he has absolutely no destination in mind as he plays. Gant is like a wild stallion let out of captivity, running and bucking and working up a lather but accomplishing nothing other than the burning off a lot of energy. Just like with the horse you admire the rambunctious fury he exhibits but are unlikely to try and saddle him and take him for a ride because you’ll never get any place at all, let alone get there in one piece. It’ll be a fun and exciting ride for sure, but a dangerous and ultimately useless one for everybody but the insurance company who will promptly jack up your premiums after you settle your claim for your broken back or ruptured spleen from your reckless adventure. Which brings us back to the intro, the one aspect of this which does have some semblance of an idea behind it. If you call it contrived I wouldn’t argue in the least. If you think it’s too long, well, from a technical standpoint you’re probably right. The whole tune – intro and all – is just 2:29 and that spoken bit takes up a good deal of it. A person putting a nickle in a jukebox might not like waiting around for the main performance to kick in and in terms of capturing an audience right off the bat, most would probably advise against such a maneuver. Yet each time I listen, as hokey as it starts off sounding when not expecting it, it quickly becomes obvious that THAT’S the part that works best! Not necessarily as a stand alone piece unto itself, devoid of the energetic music that follows, but simply as a lead in to the shambolic boogie to come it manages to ground the piece somewhat, to give it an identity of sorts. I’ve listened to it dozens of times, both seeking it out and having it pop up unexpectedly on shuffle, and without that intro I am positive I would always have to look to see who and what this was, and so it provides us something to latch onto at least and make it a little bit familiar, even if just to advertise Cecil’s name to make sure you don’t think this was some other fast-fingered, but otherwise anonymous, piano man. As gimmicks go it’s much more effective than it has any right to be. The same can’t be said about the rest of the song however. It’s certainly rousing enough and fairly enjoyable in that sense, but it’s nothing altogether special either, simply a burst of reasonably strong playing in a rough and rowdy style that fits in well enough with what’s going on around him. But more and more as 1948 inched towards 1949 what was going on in that environment is in the process of changing, leaving this type of performance to stand merely as a signpost on the side of the road, little noticed as you speed forward into the future. Without the structure or discipline to craft something memorable, to have a better idea of where he’s going and more importantly to fully grasp where the music scene as a whole is headed and try to get to that destination himself, Cecil Gant was going to remain essentially what he always was when you got right down to it – a skilled but directionless itinerant musician, enjoyable enough in the moment but forgettable before the last chord even faded into the night sky. His own moment in the spotlight was already long since over. So while Cecil’s Jam Session is a true rocker in every sense of the phrase, it’s played by a cat who was caught in a weird musical abyss, a ghost from the recent past, dead already in a way (commercially speaking, at least to the extent he once knew), yet still walking – and playing – among the living. The musical terrain he briefly strode atop has largely crumbled around him and, whether dead or alive, or not really sure, he picks through the rubble and wonders where everyone and everything recognizable has gone, like a Twilight Zone episode come to life. Even if he were to be given directions back to the main road to join the rest of society it’s doubtful he’d ever make it. Somewhere before getting back to civilization he’d wander off and disappear again all the same. Some guys are just like that, musical vagabonds destined to roam the wilderness until they land in a distant canyon somewhere far off the map, content to play with only the echo it provides as a response, and with no hope of ever getting out in this lifetime. 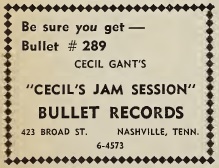 Leave a reply on "Cecil Gant: “Cecil’s Jam Session”"